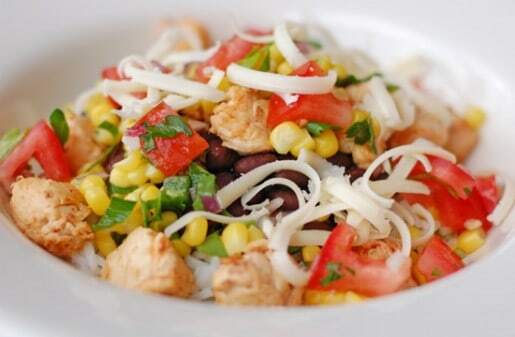 We've been slowly building Chipotle's Burrito Bowls, one recipe at a time. We started with Cilantro-Lime Rice. Then, we added Vegetarian Black Beans and Adobo Marinated Chicken. We topped it off with Corn Salsa and Mild Salsa. Marinate the Chicken first since it takes the longest. Chop the cilantro both the rice and salsa recipes and set aside in a bowl. The salsas can be made several hours and stored in the fridge. The beans can simmer on the stove or in a slow cooker until you're ready to eat. The rice will need to be done last. Fix it while cooking the chicken. The only other item you'll need is shredded Monterey Jack cheese and some chips. Let everyone layer their own bowls according to their taste and dig in! Burrito Bowls are delicious and a great casual company meal, because everyone can layer the items to their liking. Making them at home also saves money. One Burrito Bowl will cost about $6.95 in the restaurant. It will cost you approximately $17.60 to buy all the ingredients for burrito bowls to make at home, but it will serve 6-8 people. It will cost you about $2.50 per serving, however, you can save around $35.60 on dinner for 8 people! Made this last week… have only one word for it, AMAZING!!!!! These were REALLY good! Thank you for posting the recipes! We had 4 couples and a bunch of kids over and everyone loved these! I made everything ahead of time as much as I could then just finished the actual cooking right before everyone got here. I added shredded cheese, guacamole, sour cream, a medium salsa, tortilla chips, and lettuce to the bar. I cut the chicken into bite-sized pieces then marinated for 4 hours. It turned out good but it would have been even better if I had been able to marinate them even longer. I’m planning to keep some marinated chicken in the freezer for next time. 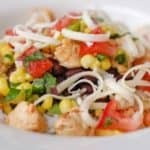 Any insight on the type of cheese / cheese blend that Chipotle uses? Rob, I believe it’s a blend of Monteray Jack and White Cheddar. After returning from US I was craving for Chipotle’s burrito bowl. Since there are no outlets in India, I had tired it out based on your recipes. It came quite well, the only downside was the beans which I did did’nt come out well, as I had replaced most of the ingredients with an Indian substitute. On the whole it was a nice experience, we would like to thank you for the wonderful recipe. Thanks for this recipe. We made it tonight and my whole family really loved it! I also wrote about it on my blog and linked to your page. I really enjoy it! This is incredible. My wife LOVES Chipotle, and it’ll be much healthier if we do it ourselves! How do I get to the recipes to make the Chipotle Burrito Bowl? Does anyone know the recipe for the dressing (In the little cups) you get with the Chipotles salads? I’ve made this twice now and it is sooo delicious!! Everyone loves it. Thanks for posting it. what about a reciepe for the steak?